With over 8,333 kilometres of coastline along the four seas, Turkey is a veritable treasure chest of coves, inlets, bays and beaches at which yachtsmen can choose a different and private anchorage each night. 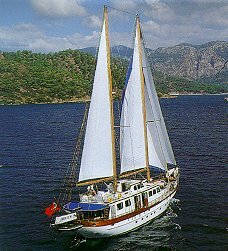 The sailing paradise of Turkey is also home to the Blue Voyage. This idyllic cruise means sailing with the winds, into coves and over the seas and becoming one with nature. It is also an experience of the history of man from the perspective of the sea rather than from the land, a journey which carries you to the private beach of Cleopatra, the eternal fires of remains of ancient civilizations. For lovers of the active life, sailing in clear waters provides great opportunities for swimming, fishing, waterskiing, surfing and diving. Sailing in Turkey also allows you to experience a truly enriching cultural exchange with the hospitable and gracious people of the coastal villages and towns. The tempered winds which generally blow from the west and northwest make the long summers ideal for yachting, and seem to encourage an appreciation of nature. From some of the turquoise coast’s unspoilt and sheltered bays you can see mountain peaks rising to almost 3,000 metres above sea level. In Turkey, modem facilities and comfort have not overshadowed ancient hospitality and the slower pace of life. The pleasure of yachting in Turkey will tempt you to come back again and again, to explore yet another stretch of coast and to relive the luxurious ease of life on the sea. TURKEY WILL BE ON YOUR YACHT’S ROUTE. 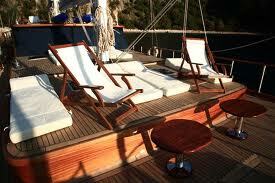 You can hire a yacht, with or without crew, in Turkey or you can sail to Turkey in your own yacht. Please visit the website of the Turkish Consulate to enquire whether, due to the nationality, you require a visa to visit Turkey or not. Hopa, Rize, Trabzon, Giresun, Ordu, Samsun, Inebolu, Sinop, Bartin, Zonguldak, Eregli, Istanbul, Tekirdag, Derince, Gemlik, Mudanya, Bandirma, Ã‡anakkale, AkÃ§ay, Ayvalik, Dikili, Izmir, Kusadasi, Didim, GÃ¼llÃ¼k, Bodrum, Turgutreis, DatÃ§a, Marmaris, Fethiye, Kas, Finike, Kemer, Antalya, Alanya, Anamur, Bozyazi, Tasucu, Mersin, Botas, Iskenderun. If you wish to enter Turkey after you have sailed through international ports and waters, then you are required to obtain a Yacht Registration Form (Transit Log), which contains information about yachts and yachtsmen. The Form should be completed in accordance with the explanations given and you will need to go through the Customs, Health and Port procedures as per the international regulations stated within those explanations and in accordance with your declaration. The cost of the Transit Log is $30.00 and it is valid for one year. However, if the owner of the yacht or the legal keeper of the yacht changes within that year and if the yacht leaves Turkish Customs Area or the Form is lost, then the term of validity of the Form comes to an end. It is possible to obtain a new Yacht Registration Form in such occurrences. You, as the owner of the yacht, and your guests on the yacht are entitled to sail freely in Turkish waters and between ports, on condition that the purpose of the trip is not commercial. You may wish to sail between Turkish ports for the purpose of travel, leisure or sport. As long as the captain, crew and the yachtsmen of the yacht remain the same on such trips, you can sail freely to the bays on your route, except forbidden areas, without the need to go through any procedures. If any change occurs between ports, in terms of your captain, yachtsmen or crew, then you should definitely make an application to the Harbour Master in your area and obtain a confirmation for the change. Foreign-flagged private yachts belonging to more than one owner and yachts belonging to an association or a yacht club, may be used by four keepers only in one year. If you are in our country with your yacht and you wish to extend your visa for your stay, then you will need to allocate a marina or a mooring place licensed by the Ministry of Tourism, as your address of residence and after you notify the authorities of the address you will be granted an extension. In such cases, the extension you can be granted on your term of residence and visa may be no longer than 5 (five) years, depending on your term of contract that you have with the marina or the moorage. You can also use your own vehicle freely, after you inform the Directorate of Customs, whilst you stay in Turkey under the term of your visa and residency. Should you wish to leave Turkey for a period of time temporarily with your yacht, you can leave your road vehicle, if you have one, which you have brought to Turkey, at places that are allocated and monitored by the Customs authorities. If, for example, you or your family need to be collected from another port or taken to another port, then your captain, on condition that he has your written or fax instructions to do so, can obtain a permit to sail from the Directorate of Port and can sail to another Turkish port, forth and back, without any yachtsmen or guests on board. Unless the authorities receive a complaint or a claim, which should be made in accordance with the regulations, no searches, either of your yacht or for any goods, will be carried out. However, if the authorities conduct a search upon receipt of a complaint or a claim through the appropriate channels and establish you to be in possession of goods that are forbidden to be taken into Turkey, then any such item or items will be seized by the customs authorities and will not be returned until your yacht leaves Turkish waters. In such instances when you have to depart from or enter Turkey for reasons of emergency, extraordinary conditions or under the obligations set out by the Law protecting life and property afloat, it is an obligation to report the case to the Turkish officials at the first port of arrival. Equipped diving is subject to obtaining permission. You can obtain the relevant information and the co-ordinations from regional Tourist and Information directorates. Whilst your yacht is in Turkey, if due to any reason (i.e. repairs, etc.) a change occurs in the inventory of the yacht, you will be required to have the necessary changes logged through the relevant Customs officials on your Yacht Registration Form. Spare parts belonging to your yacht and other material will be allowed to remain in Turkey as long as your yacht remains in Turkey. If any spare part becomes redundant following repairs carried out on the yacht and the owner wishes to take it out of Turkey, then the owner will have to have such parts registered in the inventory list of the yacht. You can also leave your old spare parts with the customs officials in accordance with the Customs Act 4458, section 164. Foreign-flagged yachts, on condition that they are sailed by their owners once every two years, can remain in Turkey up to five (5) years without a requirement for any permission. You can leave our country by another means of transport during this period after you leave your yacht at a marina or a moorage licensed by the Ministry of Tourism. When leaving Turkish ports for international ports with your yacht, you need to complete the relevant section of the Yacht Registration Form, have it confirmed by the Harbour Master and complete the required procedures at the Customs Directorate. 1) You are not allowed to use your private yacht for commercial purposes unless you obtain the necessary permission from the Ministry of Tourism. 2) You are not allowed to charge individuals you have declared as your guests for any cruises. 3) You need to be aware that if any untruthful declarations are being submitted, these will be subject to legal proceedings brought against you. 4) If you export any historical artefacts, you will be subjected to legal proceedings brought against you. Such an act constitutes a crime. 5) You should not engage yourself in any way of exchange of goods (buying or selling) that have not yet been through the necessary customs and duty procedures, with other yachts or ships. Such an exchange is illegal. Such occurrences as stated above are considered as acts of crime internationally and in our country and if such an act is established to have taken place, then the legal proceedings to follow will be in accordance with the relevant legislation in Turkey.